ePublishing Knowledge BaseePublishing Knowledge BaseePublishing Knowledge Base User Manager: Creating Admin Roles & PrivilegesHow do I create a new Admin user? 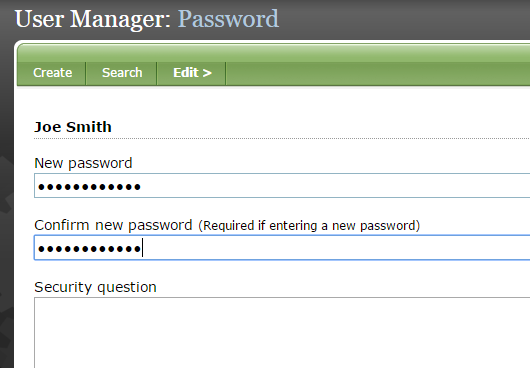 If you have a new team member and you want him to have access to your website's administration, add them to the User Manager. This article looks at how to add a new admin user, or someone that can edit your website in full or in part. You can control which tools users can access on the back-end of your website. We also share how to view what each type of user (or role) has access to, and how to edit each role's access. Be aware that if you change the privileges a user type has, it will affect all users associated with that role. 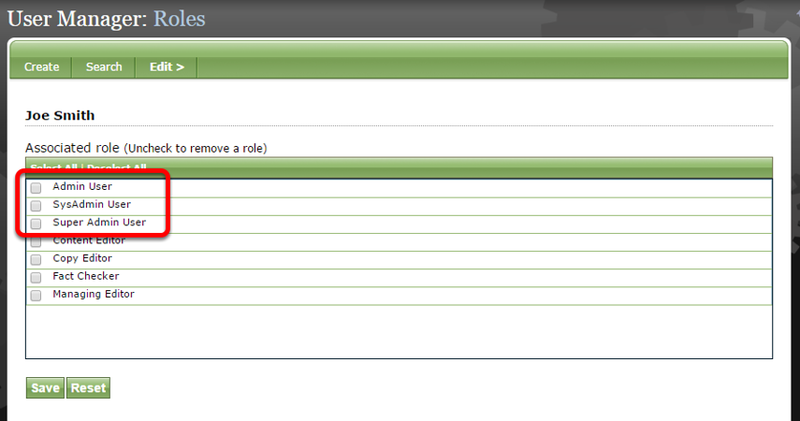 For example, if you change the access a Content Editor has, it will affect all users that have been assigned that role. 1. Under Sales/Marketing, click Create next to User. 1.1. 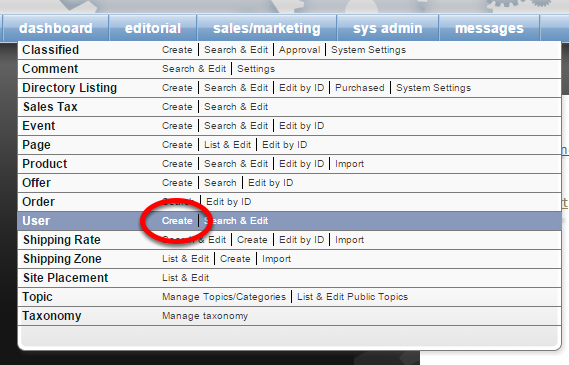 Or within the User Manager, click Create. Zoom: Or within the User Manager, click Create. 2. Add the user's information, and click Create. 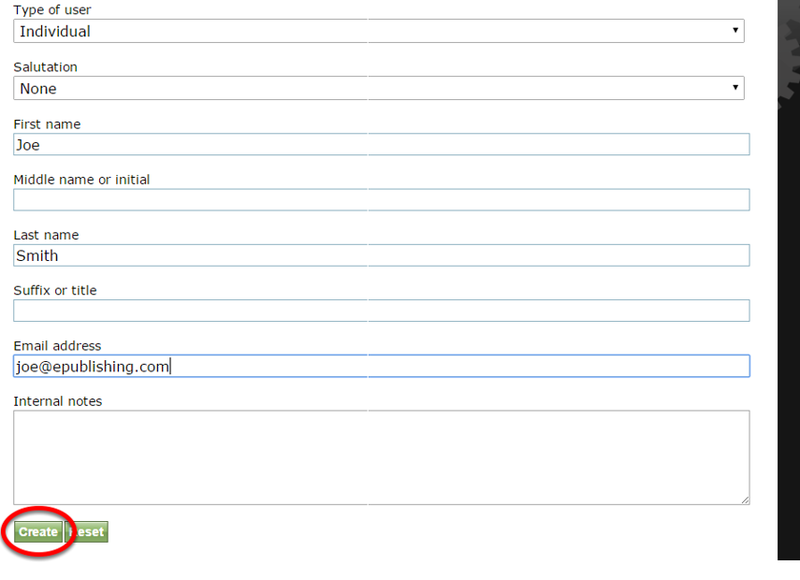 At minimum, add a first name, last name and email address for the user. Zoom: Add the user's information, and click Create. At minimum, add a first name, last name and email address for the user. 3. Click Password under Edit. 3.1. Assign a password. It must be at least 6 characters, with 1 letter and 1 number. Punctuation can be used. Make the password as long and complicated as you'd like. 3.2. ePublishing does not use security questions. 4. 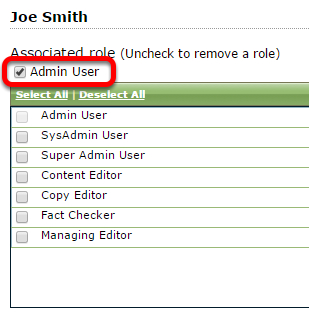 Under Edit, select Roles to assign a role to the new user. 5. There is no standard access by role across all ePublishing websites. The privileges associated with each role will vary. Please ask your Solutions Manager if you have questions. Zoom: There is no standard access by role across all ePublishing websites. The privileges associated with each role will vary. Please ask your Solutions Manager if you have questions. The three roles highlighted in the above screenshot are the ones ePublishing creates for all publishers. 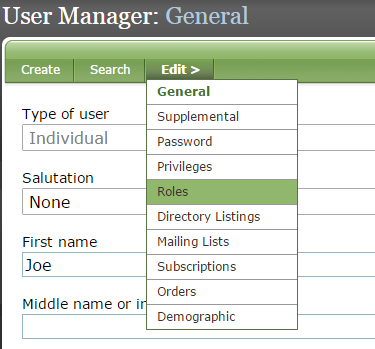 Any additional roles are created uniquely for the site and reflect the different roles that will use the admin tool. 5.1. 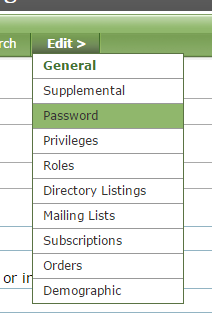 Select Admin User, SysAdmin User or Super Admin User by clicking the box next to the appropriate selection. The role will move to the top of the list when selected. In general, a Basic Admin User or Admin User will have limited access. 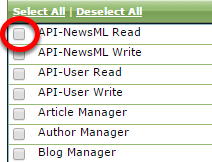 To add additional privileges, define and assign specific roles, such as copy editor. A Super Admin User will have full access to everything except SysAdmin. And very few users will need to be a SysAdmin User, if any. 6. Want to know which privileges are associated with each role? 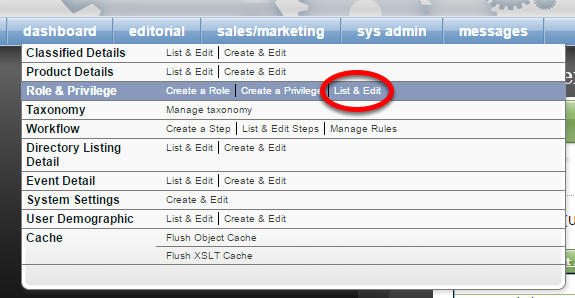 Click List & Edit next to Role & Privilege under SysAdmin. 6.1. Scroll down in the window that appears to Roles and click on the role's Internal Name. Zoom: Scroll down in the window that appears to Roles and click on the role's Internal Name. 6.2. When you click, you'll be taken to the role in the Role & Privilege Manager. 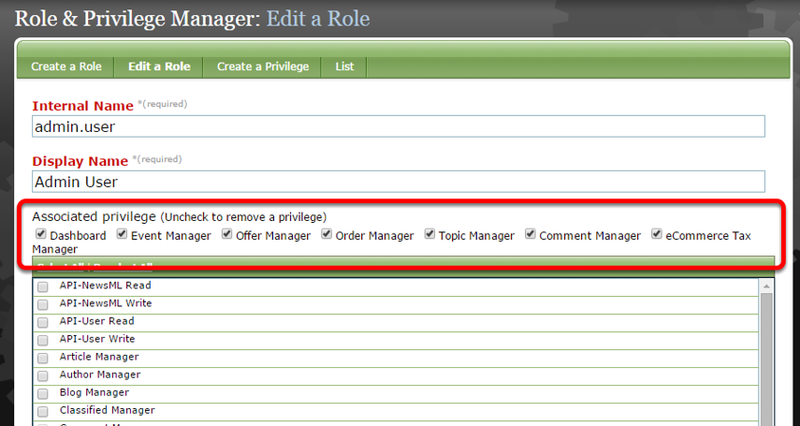 Zoom: When you click, you'll be taken to the role in the Role &amp; Privilege Manager. Do not change the Internal Name of the role. 7. To add a new privilege to a role, click the box next to the privilege. Do NOT rename the privileges. When a privilege is added or removed from a role, that user will see those privileges (tools) greyed out in the main navigation of their website's administration. A user assigned that role will no longer be able to click on those tools. 7.1. To remove one, click the checked box at the top of the list. 7.2. WARNING: When you add or remove a privilege from a role, that change will affect ALL users associated with that role. Prev: How do I add a new editor? Next: How do I add or modify a role?